N-D EMBROIDERED YOUR FASHION DESIGN PICTURE ON YOUR UMBRELLA OR USE NEW 3D SCREEN PRINT METHOD TO SHOW UP YOUR DESIGN SPECIALTY. 21"X8 MANUAL OPEN, PONGEE FABRIC WITH ELEGANT EMBROIDERED FLOWERS AS A BORDER. It could be in fashion color. We could help you to screen print logo on the case bag & cover, embroidered logo, flower on the cover too. 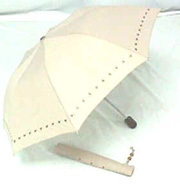 ¡@ 21"-23"x8 ribs auto open & close 2 section or 3 section mini umbrella. 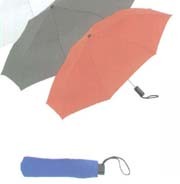 All design by using hex angle shaft to make the umbrella more strong. And all of them are Wind proof design too !! The frame & shaft could be black coated with clear runner. All of them are wind proof design !!! Super mini with elegant bag or with your own design tote bags/gift box.